Lighting is one of the most important factors for maintaining a good aquarium as the quality of light will directly influence the quality of aquatic life in your aquarium. The survival of all your plants corals and/or invertebrates depends on the correct spectrum and intensity of light provided and the best guide is to try and recreate natural conditions as much as possible. Recent improvements and innovations in lighting mean that it is now much easier to do this – first of all, bulbs have evolved so that they now come in a wide range of light spectrums and intensities, and in more compact sizes which give you more flexibility with set-up options; secondly, the development of electronic ballasts which can operate with much less heat now mean longer bulb life – altogether, these improvements have meant that it is much easier to duplicate the lighting conditions in the wild. Fluorescent Lighting these are probably the commonest and easiest way to light your aquarium. They come in a variety of colours and allow you to choose the most suitable ones for your aquarium inhabitants. The three types of fluorescent lighting are “colour-enhancing lights” which usually have a yellow or pink hue and will make your plants and fish look more vibrant; “full spectrum lights” which simulate daylight at maximum intensity and is ideal for promoting growth and “actinics” which give off a blue light and are specialised for coral growth. N.B. Do not use normal hardware fluorescent bulbs as these will not help the health or look of your tank and will actually encourage the growth of the dreaded black algae – always use fluorescent lights especially made for aquariums. Compact Fluorescents – these are very similar to standard fluorescents but give higher output while lasting longer and less energy. Halides – these are usually used to highlight one part of an aquarium, much like a spotlight or are used to provide the intense lighting needed for certain types of coral in a reef tank. If you are using these close to the water, make sure that you place a cover over them to filter out the UV portion of the light and also to protect the bulb from water splash. Tungsten / Halogen Lamps – do not use these! They may be economical but they are not designed for aquarium use and not only do they become very hot, possibly overheating your tank, but they also do not provide the necessary spectrum of light for plant growth. In addition condensation can form on them, which makes them even more of a hazard. 1)	Compact Fluorescent Lighting Systems – these use a twin-tube design which means you get much higher light output and at much greater intensity than with standard fluorescent lamps. Furthermore, these systems take up half the space of standard fluorescent tubes and they have a low operating cost, as well as producing significantly less heat than other types of light sources. 2)	T-5 High Output (HO) Fluorescent Systems – the key difference here is their tiny size combined with their incredibly intense output. This means that you can fit more of these slim, thin bulbs into a certain space and will have twice as much brightness as standard fluorescent lamps. Remember, though, that all lighting systems, no matter how modern or sophisticated, still generate heat and in fact, the more powerful your lighting system, the more you will need to cool the environment. One way of doing this is to place your aquarium in a temperature-controlled room to help balance the radiant heat emitted. In some cases, you may need to raise the fixture above the cover, so that there is extra room underneath to encourage air circulation. A cooling fan can also be used to help dissipate heat from the fixture. 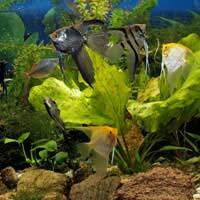 Freshwater Aquariums – the plants that normally fill these environments mostly originated in the shallow regions of rivers in Central and South America, where they receive full-spectrum light. Therefore you will need – depending on the depth of your tank and the actual plant species you are planning to keep – a standard fluorescent lighting system of between 2-5 watts per gallon. Good choices of lighting systems include Standard fluorescent, T-5 HO, VHO, Power Compact and Metal Halide/HQI. Marine Reef Aquariums – variety is the key here as the amount of light required by each type of coral can differ dramatically and it is very important to get it right as light is essential for providing nutrition. An easy way around this is to only choose corals that thrive in the levels of light you are providing. If your aquarium is less than 24 inches deep, use a lighting system between 4 to 8 watts per gallon. In general, just by replicating conditions in the wild, natural state, you will help to improve the growth and survival rates of your aquarium inhabitants, as well as enjoy a more realistic ecosystem.